Powdered with winter icing sugar. And hanging there and make themselves attractive. Thank you West and all best to you! that’s wonderful! have a good 2015! And a good 2015 for you thank you dothob! You’re so sweet, thank you Pierr! Thank you so much Joe! This one had to be in colour! Frosty beauty. I can feel the cold. Keep warm Angeline, thank you! Your picture is a perfect exhibition of the past two days. Beautiful, as always. Tom, so lovely to hear from you! How are you? Is that a belated attempt from a frost-bitten Eve? And, shall I take a bite? You have your own conscience Gerard, your call! Thank you so much MBL! Fashionably late, as usual. A fabulous 2015 to you, Patti! The year is running away already! Thank you Julie and a wishing a wonderful year ahead for you! Wonderful image, Patti. I wish you a happy and successful 2015! Patti, your work knocks me out, beautiful here, keep it coming. Tommy, you are too kind! Definitely looking forward to catching up with you soon! Thank you so much Anette and all best to you for your great work! Thank you and lovely to hear from you! Stellar pic dear Patti! Happy 2015! All best to you and yours and thank you so much Margie! Love the warm yet muted tones in this. Happy new to you, too! Always fun finding bright spots in a winter garden, thank you so much Alessandro! Thank you Annie and wishing same for you! Happy travels! and happy New Year right back at you! Thank you Emily! This is in an English garden where it was actually warmer than it is here now back in NYC – 19 degs F and sunny! Wow cold! But at least sun we have rain here now! Happy New Year for you too, Patti. seriously, that’s brilliant, Patti, and what a clever title. there was no ‘love’ button, so i clicked on ‘like’ instead which was the next best thing. thanks for sharing! urk, that happy new year right back at you ended up in the wrong spot. feel free to delete the one above, lol. haven’t had coffee yet…. That coffee start, where would we be without it although to be honest, as a seriously slow starter I need my cup of tea first, then the coffee! Thank you Kris for the love and Happy New Year everything to you! Dripping raindrops through my roof, frost only early in the morning. As though it’s not enough to put up with the rain outside it has to make its way through the roof . . . . good luck with that Rob and all best to you! What a week it has been . . . . thank you so much EQ21! Thank you Richard! I have a feeling this is going to be a very good year for you! Wonderful image Patti, love the ice crystals. Wishing you the best in 2015! Thank you Beth! Absolutely tropical frost compared to what you had recently! Thank you so much Mark and wishing you a wonderful year! Wow, something of a magical apple there Patti! Happy New Year! A hardy breed that’s for sure, thank you Cath! And to you there in the frosty Big Apple! Thank you so much Allan! It’s so cold down here now which means even colder where you are . . . keep warm! Late or not, same to you Patti! I can’t keep up at all lately, so whatever! Love the frost! I like your “so whatever” Lyn, we get there eventually but, like you, limping along with the keeping up! So unlike your city scenes – but also great. Thank you Rabirius, I do break out now and then! Thank you so much Elena and happy new paintings to you! brrrrrrrr that shot makes me feel colder than I already do! happy new years, Patti! Must be cold if you’re feeling it Derrick! Wishing you a great year and many more blazing sunsets! I love your glitzy red apple ! I know what you mean about the year having only just begun but I have let so much slip by lately . . . Thank you so much Poppy and am sure you will have many more wonderful adventures for us all to enjoy this year! Wow, thank you so much Gaynor for the re-blog!!! Looks to be real chilly over there Patti! This little apple was shot far, far away from the Big Apple Martin! 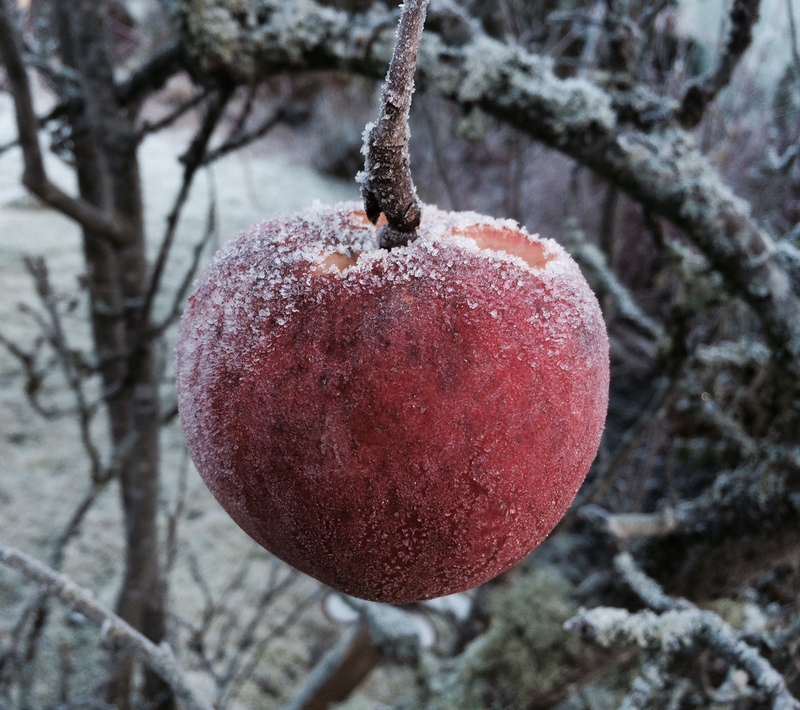 A home grown frosty Devon beauty! If it’s a cherry … I’d like it in a drink. It’s so frosty. Really … is it an apple? Love it !!! Issy, for you, it can be anything you want it to be! Wow, how did I miss this one?! It is absolutely wonderful. May this year be good to you! Hope the year has started well for you, Patti.